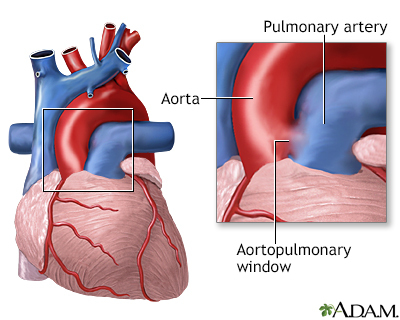 Aortopulmonary window is a rare heart defect in which there is a hole in between the aorta and pulmonary artery. Because of this hole, blood from the aorta rushes into the pulmonary artery and too much blood flows through the lungs. This condition happens during the development of the baby's heart and is present at birth.